Global Cross-Linked Polyethylene Market size was worth over 3 million tons in 2017 and will witness gains at over 6% from 2018 to 2024. Shifting consumer usage towards cross-linked polyethylene pipes in the potable water distribution applications is propelling to an increased share in the plumbing field. Rapid residential growth in the Asia Pacific countries such as China & India is among the key factors proliferating the business expansion. 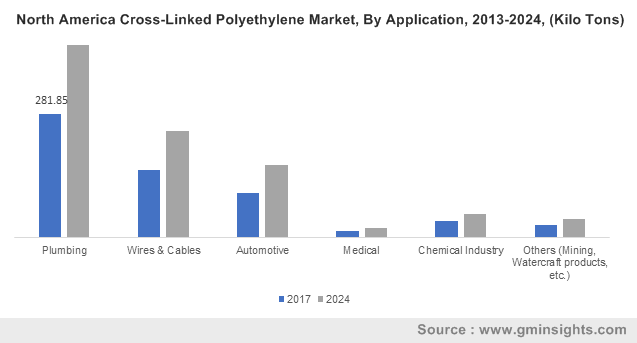 Further, significant development in the automobile segment owing to the rise in electric vehicles usage will augment the cross-linked polyethylene market portfolio. Substantial shifts in the popularity over the conventional copper tubes owing to the corrosion & fire resistance property will enhance the market growth. Widespread applications in the end-use industries are increasing including insulation, packaging, and consumer goods owing to the flexibility, easy installation, and low costing. Rising plastic pipes usage in the solar industry will further fuel the product penetration in the cross-linked polyethylene market. Inclination towards the cross-linked polyethylene market applications in the medical surgeries over traditional polyethylene wear is expected to enhance the total knee arthroplasty survival rates. For instance, as per the National Centre for Biotechnology Information (NCBI) article, orthopaedic manufacturers are preferring for osteolysis treatment which is caused by polyethylene particulate wear debris. In addition, wear testing of cross-linked polyethylene in hip simulators is witnessing a favourable reduction of wear rate as compared with other polyethylene variants. Surging implementations in electrical tubing and chemical storage tanks will promulgate the product line development. However, safety issues pertaining to the plumbing & pipes failure may restrain the cross-linked polyethylene market growth. HDPE market accounted for over 40% share by revenue in 2017. High quality standards of thermosetting nature in HDPE has resulted wide usage in various applications. Cross-linking structure present in HDPE provides improved resistance to the stress, cracks, abrasions, and corrosion owing to their high tensile strength. In addition, lower costs and extensive utilization in pipes & tubes manufacturing owing to their usage in hot/cold water and gases transportation will fuel the product demand. Hence, an upward application trend in numerous areas will foster growth opportunities for the cross-linked polyethylene industry. LDPE market size is anticipated to surpass USD 2 billion in the forecast period 2018 to 2024. Significant growth in the packaging industry coupled with increasing demand in the construction and automotive sector are among the factors enhancing business expansion across the world. Manufacturing costs for LDPE are much lower than other alternatives owing to the easily available raw feedstock. Moreover, the product is used for manufacturing wire & cable insulation and injection moulding owing to high resistance and high thermal conductivity to the various chemical reactions. Therefore, rising product popularity among consumers will augment the cross-linked polyethylene market landscape. Chemical process market was accounted for over 80% share by volume in 2017. Chemical processes consist of free radicals generated through different chemical reactions. Major industry applications for the cross-linked polyethylene market includes water service lines, ice & snow melting heating systems, reclaimed water distribution, and ground source geothermal systems. Rising product demand in the construction and automation industries will support the business augmentation. Cross-linked polyethylene market from physical process is anticipated to surpass USD 1 billion in the forecast period 2018 to 2024. Free radicals are generated through radiation methods in physical processes without any chemical additives resulting in the polyethylene cross-linking formation. Upsurge in the medical industry growth owing to the applications in hip arthritis treatment, prosthetic implantations in body parts, and body parts particularly hip & knee replacements will enhance the product portfolio. Peroxide technology market was valued over USD 1 billion in 2017. Major peroxide cross-linking properties such as high heat stability, simple compounding, and enhanced shelf life stability will promote varied commercial applications in different industries. Surging automotive industry owing to the rising demand for automotive seals, hoses, shock absorbers, and cables in various vehicle manufacturing will propel the industry expansion. Silane grafted technology will witness a CAGR over 6% by revenue in the forecast period 2018-2024. Key properties including cross-linking at room temperature, low cost, and higher gel percentage will foster enhanced opportunities for the product portfolio. Industrial usage including XLPE production for insulation in water heating pipes & electrical cable and floor heating purposes will promulgate the cross-linked polyethylene market growth. Plumbing application demand was estimated over USD 1 billion in 2017. Increased exposure to the moisture, salts, acids, and varying climatic conditions results failure of PCV pipes and conventional copper in the plumbing lines. These pipes are the suitable & efficient alternatives owing to their easy installation and resistance to continuous moisture, acids, & salts. Growing widespread applications of cross linked polyethylene in plumbing owing to its benefits will foster new opportunities for the business expansion. Cross-linked polyethylene market from automotive application will witness CAGR over 6% in the forecast period of 2018 to 2024. Increasing applications for manufacturing battery cables & automobile parts in the power distribution & transmission channels in automation industry will drive the product portfolio. Moreover, rising trends in electric vehicles segment including hybrid & electronic cars will boost the product demand in the automotive applications. Asia Pacific cross-linked polyethylene market was valued over USD 2 billion in 2017. Product usage is rapidly growing across the globe owing to the numerous applications such as wiring & cabling, automotive, medical, and plumbing. Surging population and consumer purchasing power in the major countries including India, China, Japan, and Indonesia will proliferate the manufacturers significant demand. Expansion in the construction sector, greater investments in public & industrial infrastructure, and development of gas pipelines & sewer systems owing to the rapid urbanization will fuel the regional business landscape. Moreover, emergence of several automation production facilities and strong industrial base establishment in the developing countries will support the overall industry growth. Europe cross-linked polyethylene market is anticipated to surpass USD 1.5 billion in the forecast period 2018 to 2024. Improvements in the inferior & low-grade materials used in the plumbing systems and water distribution will proliferate the product demand in the region. In addition, the rapid advancements in the automotive & construction sector in major European countries such as Germany, France, Italy, and UK will escalate the overall cross-linked polyethylene market size. Global cross-linked polyethylene market players include Silon S.R.O., The DOW Chemical Company, Lyondellbasell Industries N.V., Akzonoble N.V., Vinacom Co., Ltd., Exxonmobil, Chemical Company Inc., Arkema Group, Borealis AG. Other prominent industry players are Falcone Specialities AG, Zimmer Inc., Hanwha Chemical, Polylink Polymers (India) Ltd., Vanderbilt Chemicals LLC, Polyone Corporation. Manufacturers are anticipated for significant investments in the R&D and applying innovative solutions through improvised technology for attaining competitive advantage. 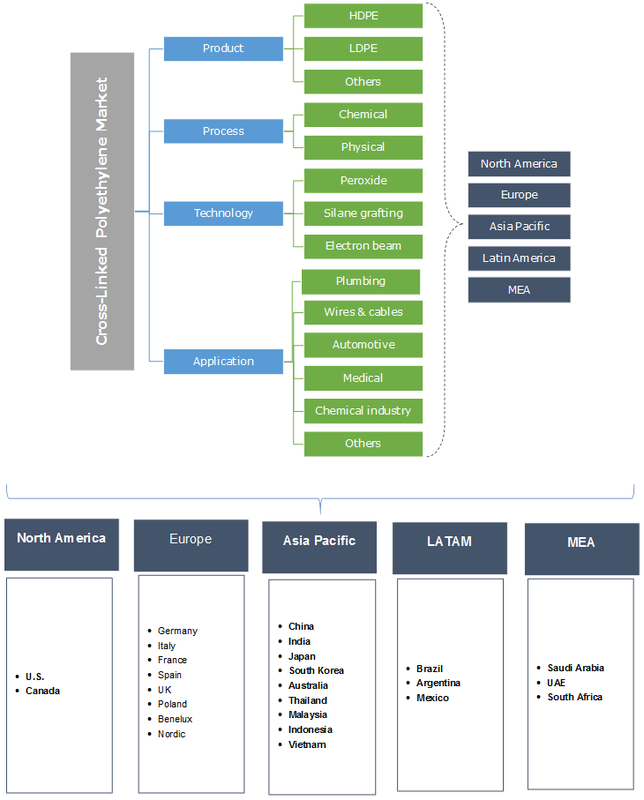 Companies are adopting numerous merger and acquisition strategies to improvise their cross-linked polyethylene market share. For instance, in June 2018 Polyone Corporation, a leading manufacturer for the specialized and advanced polymer materials acquired Plasticomp. The acquisition will expand the company’s footprint into the LFT composites segment. Cross-linked polyethylene is a polyethylene form attributed with cross links commonly abbreviated as PEX. They are predominantly used in the insulation for high tension electrical cables, building services pipework systems, domestic water piping, and hydronic radiant & cooling systems. In addition, they are used for natural gas & offshore applications, transportation of sewage & slurries, and chemical transportation. They are the effective alternatives to copper tubes, CPVCs, and PVCs in the residential water pipes usage. U.S. and Canada approved the usage in 2009. Building Standards Commission approved PEX plastic pipe and tubing to the California Plumbing Code for its applications in various clinics, hospitals, and commercial & residential construction across the state.